This kit is designed for power soccer athletes who use mid-wheel drive wheelchairs with single-post footrests. 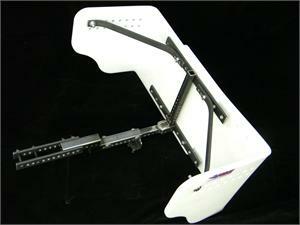 Attach the kit to your PS Force Soccer Guard, then secure the mount to your footrest! Please note the PS Force Soccer Guard is NOT included. For the full assembly, visit the PS Force product page and select the “Center Post Hardware Kit” option.